I can tell by the smell of mountain laurel wafting through the hood that SPRING is upon us! The Sunshine Community Gardens annual plant sale will be held March 3, from 9 a.m. until 2 p.m., at 4814 Sunshine Drive, Austin. The Sunshine Community Gardens annual plant sale is an outstanding source for organic starter plants, offering many varieties of tomatoes, peppers, eggplants, herbs and other items. Arrive early for the best selection of hard-to-find and popular varieties. Free admission. 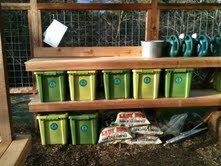 Visit http://www.sunshinecommunitygarden.org/ for a complete list of items. -Thursday, March 15th - Local Food and You - The Purveyors - Markets, Institutions, Rests. As you've probably noticed, Local Food has been getting more and more visible - from Edible Austin, to Eat Local Week, to new and existing Farmers Markets, Farm Stands, and Local Delivery services, to local gardening classes and from the media. The price of oil and transportation are narrowing the price gap and shoppers, buyers, cooks, and customers are enjoying the good taste, feeling increased energy from the nutrition, feeling safer from toxins, and having fun supporting local businesses - their friends and farmers. Please attend these important sessions - they are free; all are welcome. Show your support, learn about the latest in crops, products, markets, and businesses. Learn what you can do to help this vital local resource grow and prosper - for the good nutrition and sustainability of all. Please be there - Thurs., March 8th and 15th, 7:00-9:00, Habitat Suites Hotel. See you there. Big LOVE in the Garden! We have had quite a good time in the garden lately. Lots of visitors at the Garden Markets each Saturday from 9-10 am, then off to the local farmer's market for locally grown/organic eggs, meats, cheese, more veggies and KOMBUCHA! The Rollingwood Women's Club and Texas Industries have each generously donated $1500. to the Rollingwood Community Education Garden! We are so grateful to have such amazing support and will do our best to put that towards meaningful projects. THANK YOU!!!! Our first has already been completed. The space under our rain collection roof was a catch-all for watering cans, plastic sheets, netting, and all sorts of garden paraphernalia. We needed a spring cleaning big time. Don Harris, our awesome neighborhood architect, designed a very simple and elegant shelving system. He even added a bench between two support posts, (taking care to allow for our fledgling grape vines to continue their climb). Kirby Fry and his crew from Southern Exposure Building, came in last Thursday and banged it out in one day. Thanks guys for a beautiful job well done! Our next project will be the educational signage we would like to place outside the garden explaining the Square Foot Garden method, Rainwater Collection System and Composting. This will be a great educational tool for those wanting to learn more about the garden as they walk along our new trail. Please contact me if you have talents in the graphic design/exhibit display departments. All that new cedar shelving that was just put in needs to be sealed with linseed oil to protect it. In fact, the whole garden structure could use another coat or two. I will be out at the garden this Saturday 9am with paint brushes and linseed oil to get crackin'. My eager and enthusiastic (ha!) teenagers will be with me to help. This is a Community Service project that will count towards Westlake High School hours if that's a motivator. Dress grubby, bring gloves and come on down! i <3 the garden, and you too!